It's your birthday, and the Party Cube has landed. Mario and friends take part in a Mario Party in order to win their birthday presents. Select a Mario character, hit a Dice Block and move around the board. 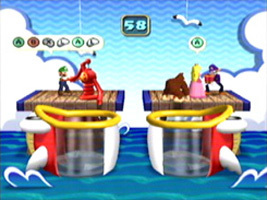 Once all four players have rolled, the teams are decided and you enter a minigame to earn Coins. Collect Coins to buy Stars from Toad. The player with the most Stars at the end of all the turns is the winner. Your birthday presents are sent to a room where you can view them whenever you like. You can play against the computer in Story Mode, or with 4 players in Party Mode. You can also practice minigames or take part in special events.